The monarch of the moor? 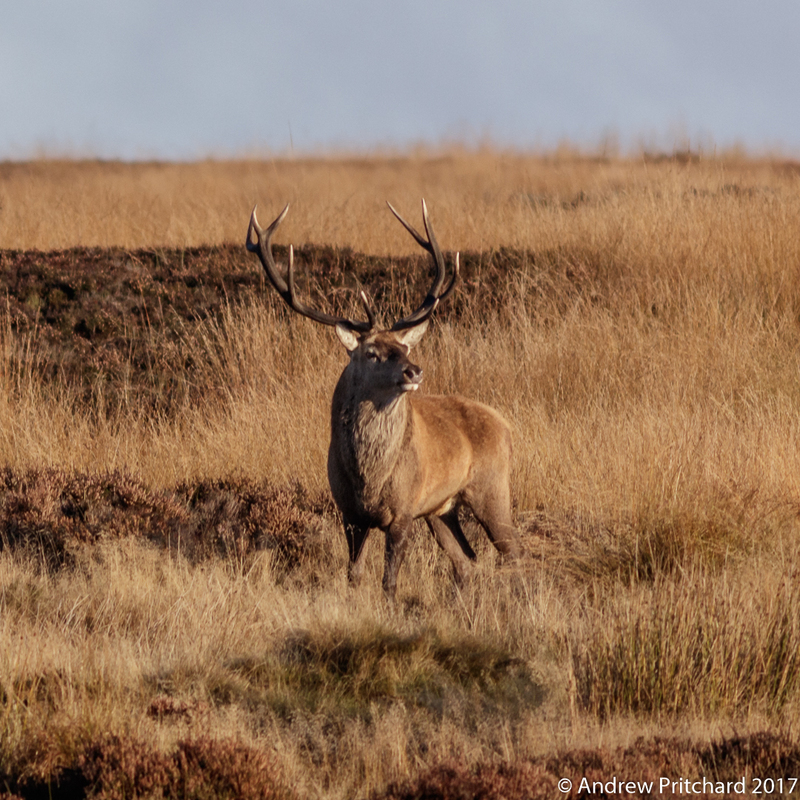 Even as monarch, this stag seems to wandering the moor alone, but it is possible he is on the lookout for more hinds to add to his harem. 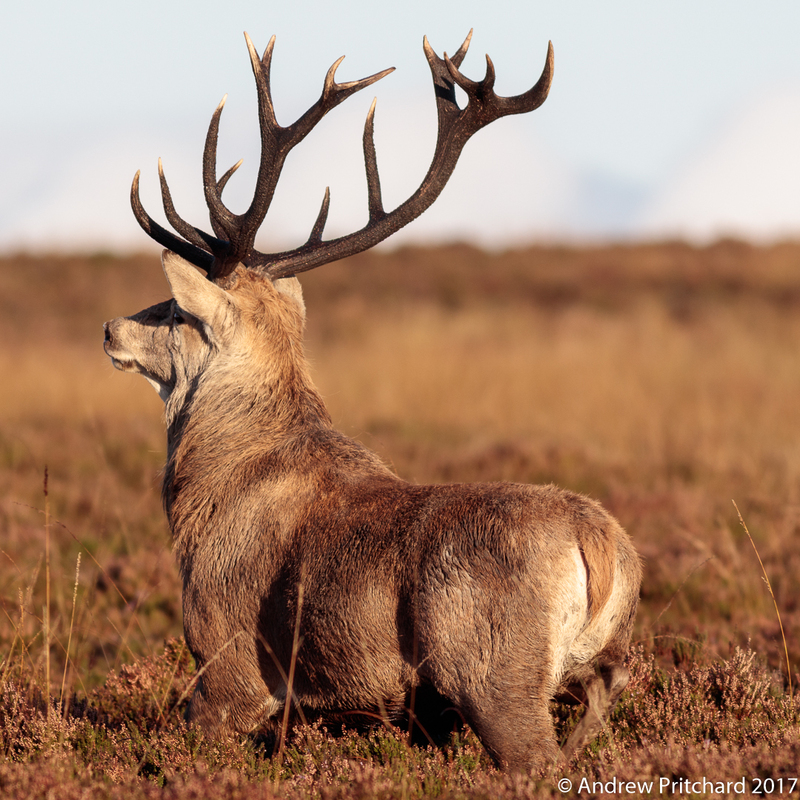 A stag with this many tines must be close to his prime, but it could also mean he is just past his prime, and no longer able to beat the youngsters in the rut. 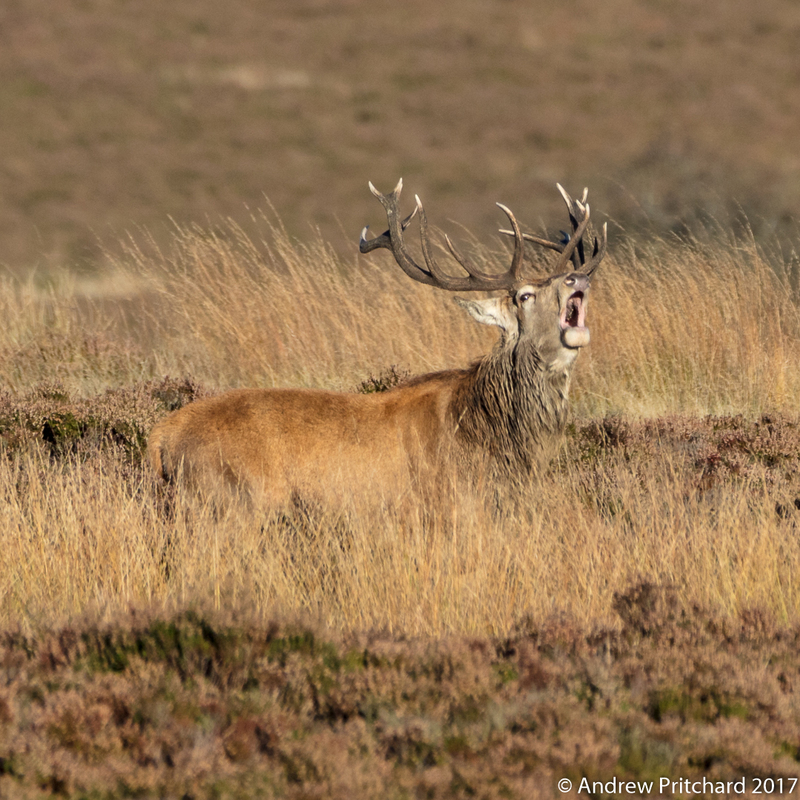 He is still clearly full of testosterone, wandering the moor periodically roaring to make his presence felt. Later we will see what can happen when one stag tries to entice another's hinds away from the harem. If a hind likes the sound of an interloper stag who is roaring nearby, she may well be tempted to follow the newcomer as he makes his way back to his own harem. 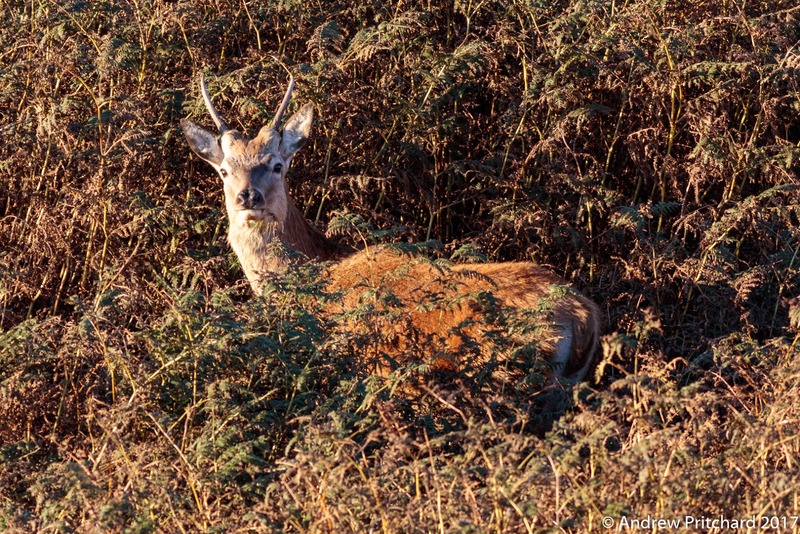 A brocket appears to be hiding in the bracken. It may be sensible, as with the hinds with young calves do, to hide out of the way of rutting stags. There are still large areas of bracken in addition to the areas of grass where smaller animals may effectively hide, although lying down might be more effective in this case! Get the shot at all costs! 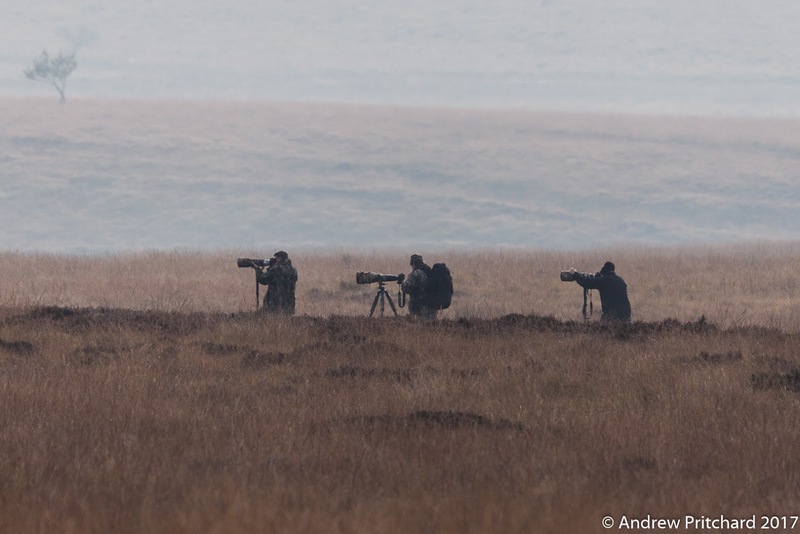 These three photographers out on the moor stalking stags seem oblivious to any danger from rutting stags. It may well be quite safe in this area, where the deer are considered feral, being escapees from a nearby deer park some years ago, now breeding freely on the moor. 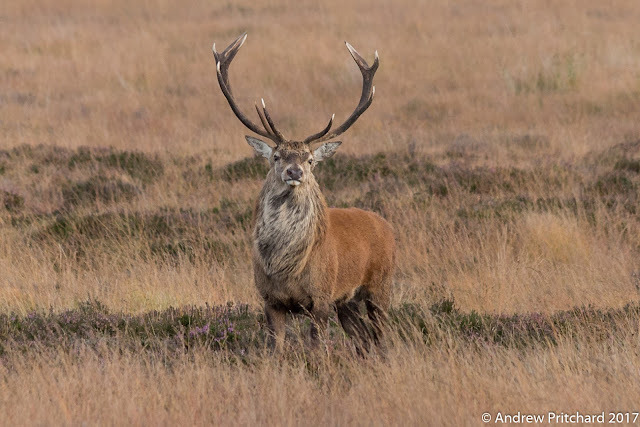 There are places where red deer are almost tame, and can be very dangerous to humans not just each other when highly agitated during the rut. A stag stands proudly with a shaggy neck mane and impressive antlers. He appears to be staring at the camera, as if deciding what to do! If out in the open such as the three photographers shown above were, there is nowhere to escape to should a stag become aggressive. Standard advice is to climb a tree, and wait out the situation, until the stag moves away. Unfortunately the trees on the moorland are not only few and far between, but they are also very small! A stag and hind stroll through moorland grass silhouetted against the early morning sky, with clouds lit from below by the rising sun. 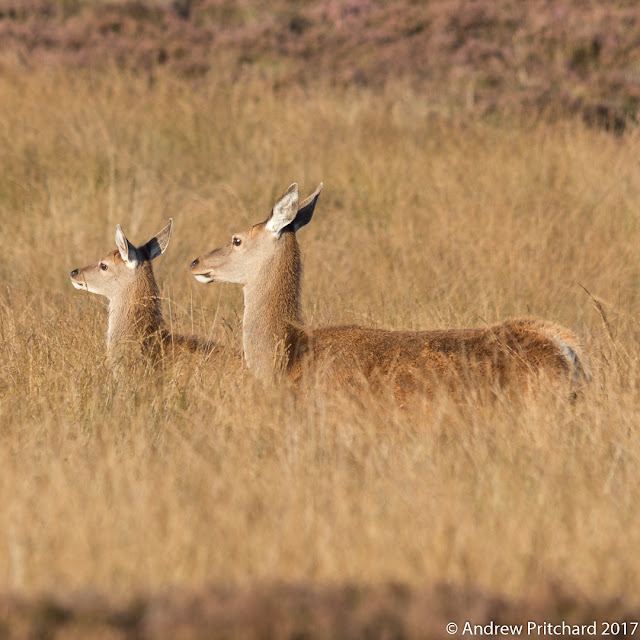 Luckily humans are much more likely to see deer moving away from them than towards - a useful feature of deer behaviour during the rut. They are also less likely to stampede at this time of year, as the stags seem to give the rest of the deer a sense of safety. Two stags stand watching, near to a group of hinds. What are they watching - perhaps looking for the stag who has gathered this harem. Neither seem bothered about the presence of the other stag, so it is unlikely that one of them is the stag in charge around here! We will see later what can happen when one stag has designs on the hinds currently with another stag, and how much effort goes into keeping a harem together. 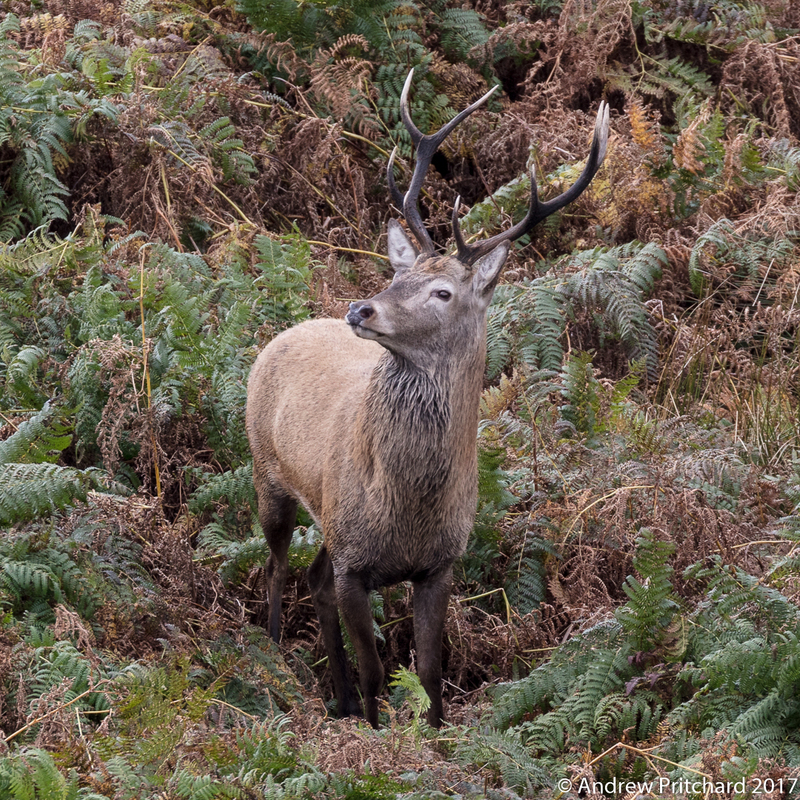 A wet looking young stag stands amongst the bracken looking to his right. Nearby there is an area of streams and wetlands which is quite boggy. It seems judging by the water or mud on this stag that some of that wet area is at least chest deep to this stag. Stags travel a lot during the rut looking for likely looking hinds to potentially mate with. Most of the hinds will have been gathered into groups called harems by the top stags in the area, but less successful stags are often looking for some peripheral or loose hinds to get to know! A young stag stands next to tree, branching antlers echoing the growth of the tree. What would a stag give to have antlers as big as the tree I wonder? Quite impractical for use in the rut, but I doubt he would have many challengers. Antler size is one of the deciding factors when stags are sizing each other up by parallel walking. It is interesting to note that a raised stick will deter cattle from approaching a human, I wonder if the same may be true for stags... I hope I never have to find out! Two dogs facing a stag. Two brown pointer dogs facing a stag either side of the remains of an old dry stone wall. These dogs were running loose on the moor, and apparently not in close control as requested by the RSPB and National Trust at this location. They seemed very interested in the wildlife, until it turned out that the wildlife was a lot bigger than them, and armed with an array of sharp stabbing implements. The stag is keeping a close eye on the two dogs nearby, having seen them off. The dogs may have been lucky that the old tumbled down dry stone wall was between them and the stag. 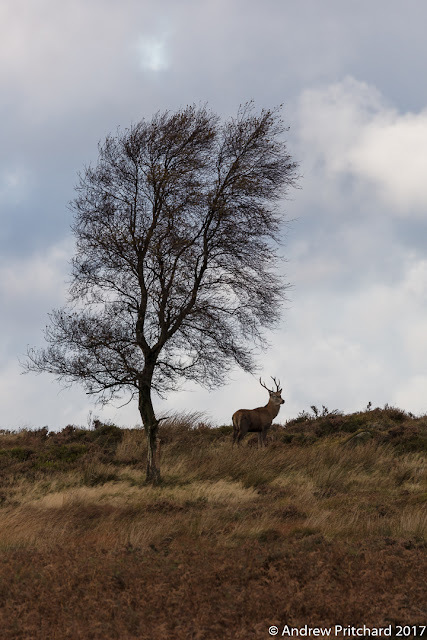 The stags can move very quickly when agitated, and would probably think nothing of chasing off dogs on open moorland. Clambering over a pile of old gritstone blocks that used to be a wall would be more challenging to a large beast with cloven hooves. A stag and a hind attempt to mate on the open moor. This is what the rut is all for, when one of the hinds in the harem comes into season for a short time, perhaps as little as a few hours. 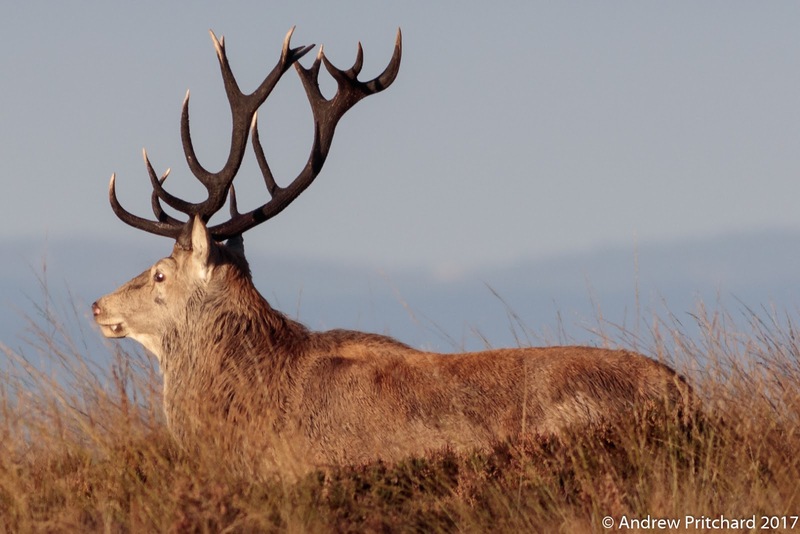 The stag must be ready to mate, as she will not be available for long, and will not be in season again for two or three weeks. This explains the stags' habit of keeping hinds together in a harem, as then when a hind is in season she will be nearby, and hopefully available. Early morning hind and stag. A hind and stag stand in the heather in the cool morning light. 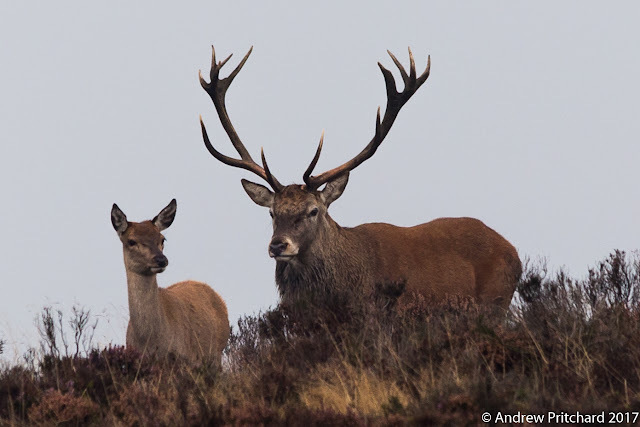 It's a cloudy and cold morning, and the stag does not look impressed. The deer are still looking quite red, so have perhaps not developed their greyer winter coats yet. Cold October mornings could be challenging for anyone still in their summer gear! 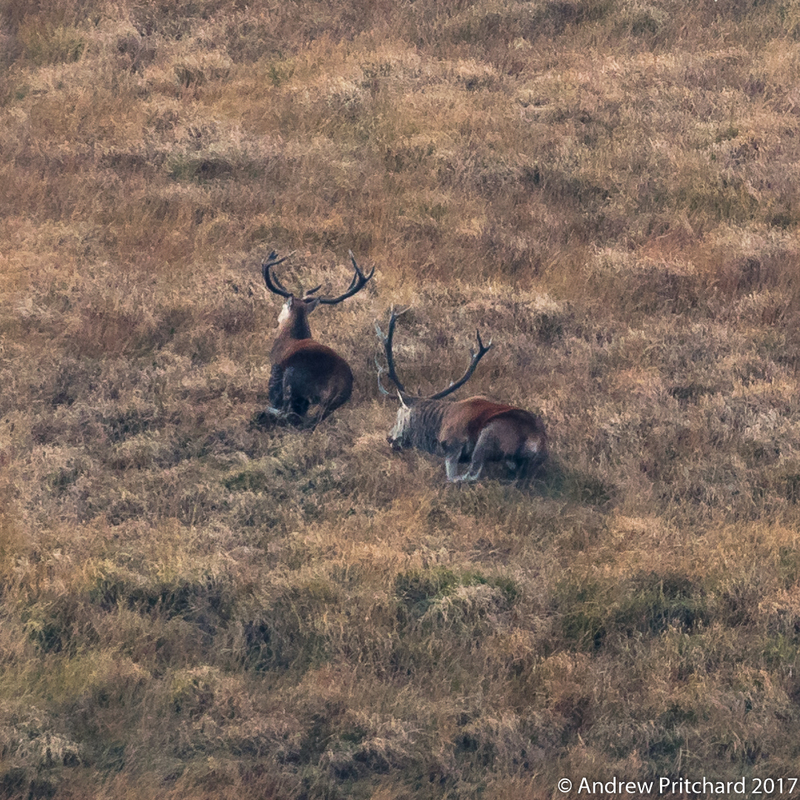 On these colder days, and with the wind whistling through the moorland grass it is common to see the deer lying down amongst the hollows and heather to escape the wind. 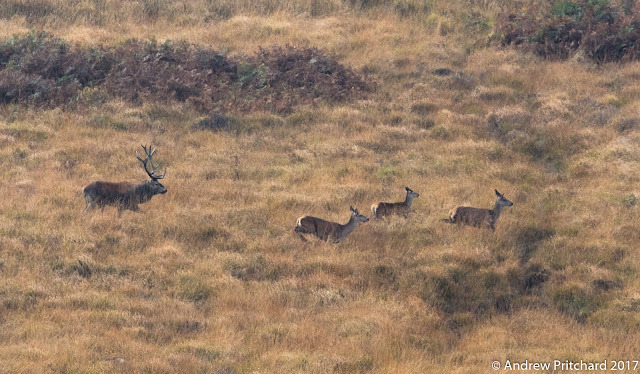 One stag attempts to entice some hinds away from another stag's harem. There seems to be a split in the ranks, with two hinds walking towards the interloper's territory, but all the hinds are moving away from him. They seem to know what is about to happen, with one stag approaching the other, although there is no sign of any posturing at this time. Head to head, antler to antler. They just get straight down to it! The two stags fight, struggling head to head, with clashing antlers locked together as they test each other's strength. The victor here will be the one who manages to push the other backwards. The intent is not to damage the opponent, as the antlers lock any penetration through is not possible. As soon as one stags begins to lose, he quickly turns to flee. Now he must retreat as quickly as possible to avoid any damage to his rear or flanks as the victor charges after him. 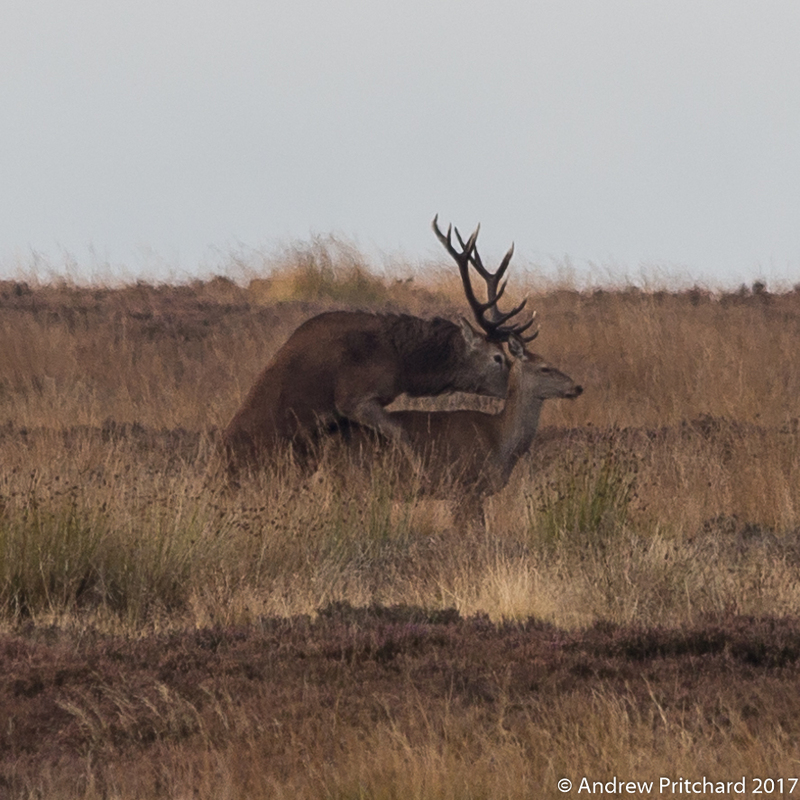 I suspect that now the winning stag is on the charge, any contact between them could prove very damaging to the loser, with his unprotected rear end vulnerable to sharp antlers! 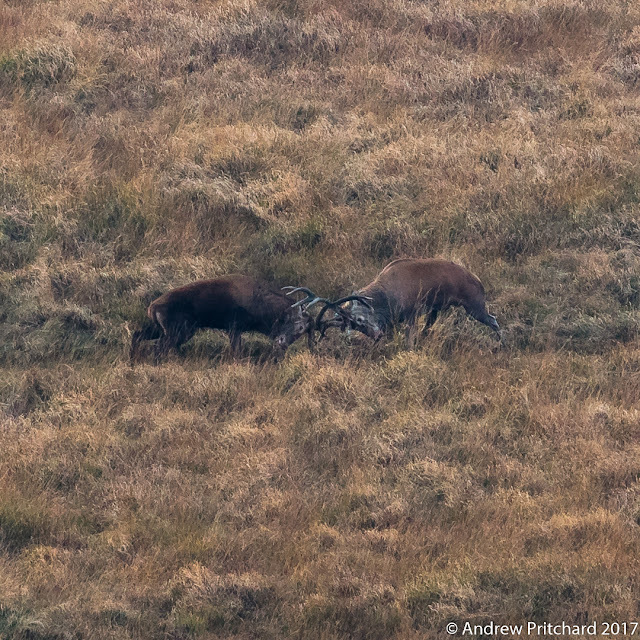 Not only does the winner have to chase off the challenger, but the victorious stag also has to regather the errant hinds. Some of those hinds were looking as if they had been convinced of a better time in the challenger's harem than their current one. The victorious stag must also chase after them and herd them back to his own territory. 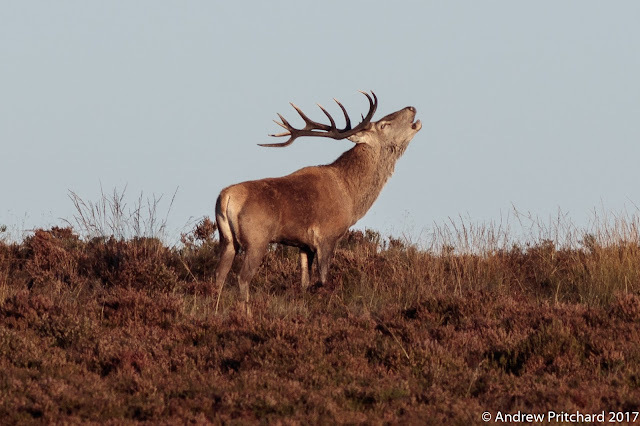 A stag roars, his teeth clearly visible at the back of his wide open mouth. The deer browse on grass and heather, so spend a lot of time first chewing and swallowing, then regurgitating and chewing again. This stag proves he has the molars to do the job, but no one is really interested in his teeth right now. Of more interest are the size of his antlers, the thickness of his mane and the strength of his roar! These are stunning photos. Well done for finding the Monarch with all those antlers. That would make a fine Christmas card!